When we tested Manhattan's Plaza DT-100+ Freeview SD receiver in February we praised it not only for its performance but also for pushing the boat out by including multimedia playback from USB drives (a rarity on Freeview zappers). So it comes as some surprise to learn that its first Freeview HD receiver is somewhat of a 'bare bones' affair – more than adequate for the business of watching Freeview SD and HD channels but lacking in features. It certainly looks good, with a two-tone black and silver colour scheme that should co-ordinate nicely with most people's living room AV setups. Sadly, Manhattan has not included a display of any kind save for a fetching blue LED power light – but we like the way that operating buttons are tidily concealed beneath a pull-down flap. The rear panel has an aerial loopthrough while AV connectors comprise two Scarts and an S/PDIF audio output. Data ports are Ethernet (included for when Freeview decides to launch BBC iPlayer) and USB, though the latter is currently only employed for applying software updates (also broadcast over the air) from external drives. The remote is better than that found with many of the Manhattan's contemporaries. It bends downwards at the bottom so it sits relatively comfortably in the hand and while there's little variation in button size overall, the most commonly used ones are generally in quick reach of the central pad – making it reasonably intuitive to operate. An exception, however, is 'Exit', which we came to use quite a lot – it could be better placed. It's also a shame that you can't quickly call up the channel list by hitting a button rather than having to go via the menus. The tuner made quick work of finding SD and HD channels, managing to pull in the latter at a location where other equipment has failed. The software is attractively presented, using a row of six labelled icons as the main jump-off point. You can use the main channel list to create a single favourites list (which can then be cycled through using the remote's Fav button) and pin-lock channels if needed. A slickly presented EPG has a familiar arrangement and can be navigated with minimal slowdown. The selected channel runs in a window in the top right-hand corner of the screen with a synopsis alongside. Underneath this is a programme grid with eight-day data for channels (you can have eight onscreen at a time) displayed in a timeline. The remote colour keys can be used to skip back and forth in two or 24-hourly chunks. It lacks the sorting options found on boxes from the likes of Technisat and Humax, but you can set reminders and HD shows are picked out with an HD label. The programme information bar can be used to browse seven-day data for current channels and others without needing to jump to them and to also set reminders. 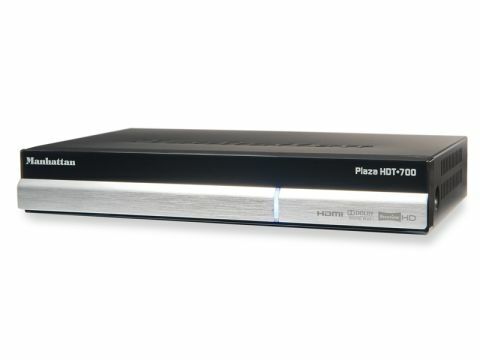 The receiver generates crisp-looking pictures from both HD and SD channels. Upscaling (up to 1080p) via the HDMI is a nice bonus and though it won't do wonders for repeats of Murder, She Wrote, it does add a discernible degree of picture clarity without introducing artefacts. Audio also sounded punchy on our test TV via Scart and when hooking up the S/PDIF output to a hi-fi system, especially listening to music on radio stations.